Obituary – Miller, Joan Esther (Thiele) « Perry High School Alumni Association, Inc.
﻿F.T.A. 51-53, Office Staff 52-53, Class Assemblies 49-51, Band 49-50, Band Queen Attendant 51-52, Home Room Secretary and Treasurer 52-53. 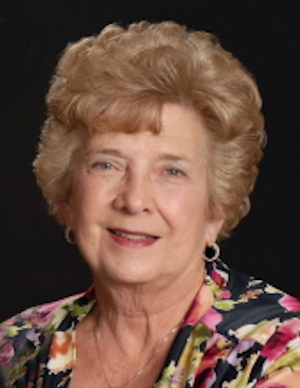 Joan Esther (Thiele) Miller, a beloved wife, mother, grandmother and grandma great, went to be with her loving Savior on July 19, 2018 at her family farm in Perry, Oklahoma. Arrangements are under the care of Dighton-Marler Funeral Home of Perry. Funeral service will be held on Monday, July 23, 2018 at the Christ Luther Church in Perry at 10:00am. There will be a private interment for the family. Visitation will be held on Saturday, July 21, 2018 from 1:00pm to 8:00pm and Sunday, July 22, 2018 from 1:00pm to 6:00pm with family greeting guest from 4:30pm to 6:00pm at the funeral home. Joan was born May 14, 1935 to Otto and Nena (Baetz) Thiele on the family farm east of Perry. 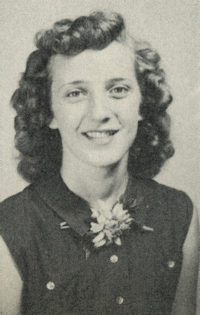 She attended Pioneer country school and Christ Lutheran School before entering Perry Jr. and Senior High Schools. Her first job was as proof reader at the Perry Daily Journal. She later worked for Sears and the OSU Extension Office. She was active in the Noble County Extension Homemakers, as a Blue Bird Leader and a 4-H leader for 25 years. Joan married Starling Miller on January 21, 1977 and three years later they opened Starling Miller Real Estate and Auctions. The business became a family endeavor and she and “Doc” worked side by side holding countless auctions throughout the State of Oklahoma throughout their 38 years of business. They enjoyed singing with a group at the local nursing home. In 2009, the Spring Livestock Show was dedicated to her and Doc for their volunteer work with 4-H and FFA youth. She had a competitive streak and loved watching her grandkids and great-grands in all their sporting activities. She was also a huge OSU girls basketball fan. She collected angels and crosses and loved growing and sharing flowers. She will be remembered for her walk with the Lord and her service in His name, for her legendary homemade ice cream, her beautiful flower gardens and her kindness in remembering hundreds with cards, baked goods and meals when they were in need. Joan was a lifetime member of Christ Lutheran Church, having been baptized as a baby there on May 26, 1935. She was Confirmed on June 5, 1949. She taught Sunday School for two decades and began singing with the church choir as a teenager. She was active in LWML, as was her mother before her. One of her greatest honors was being chosen as Oklahoma’s first LWML “Unsung Hero”. In recent years she joined the church quilting group and it became her “Tuesday passion”. She is survived by husband, Starling Miller of the home; daughters, Debbie Hooper and husband Tim Dolezal of Stillwater, Diane Hines and husband Eric of Perry, and Delinda Hobbs and husband Royce of Stillwater; and son, Kendell Miller of Stillwater; thirteen grandchildren, Angela Dooling (Nick), Mandie Hanni (Marty), Leslie Hooper-Boley (Chris), Britton Hobbs (Candace), Derek Hines (Carol), Reagan Lynch (Justin), Jeremy Hines (Jessica), Taylor Hobbs (Casey), Casey Dolezal, Jordan Hooper, Seneca Poulton, Tillmon and Shylo Miller; nineteen great-grands, Chase and Kolby Dooling, Bailey and Trey Freeman, Jaidyn Hooper, Addie and Alex Hobbs, Joanna, Jesse, and Timothy Hines, Ryan Kate and Shepherd Lynch, Evan Young, Cayleb and Aiden Delcore, Owen Hines, Haidyn, McKinley and Teagan Hobbs; sister, Peggy Gottschalk and husband, Jimmy of Perry; and sister-In-law, Jane Thiele of Perry; numerous nieces and nephews, Ray and Annie Gottschalk, father of her daughters and many dear friends! She was preceded in death by her parents, Otto & Nena Thiele; brother, Paul Thiele; and infant grandson, Tucker Hobbs. In lieu of flowers, memorials may be made to the National LWML (Lutheran Women’s Missionary League) through Christ Lutheran Church c/o Dighton-Marler Funeral Home, 203 E. Fir, Perry, OK 73077.